Need an Easter sweets recipe? 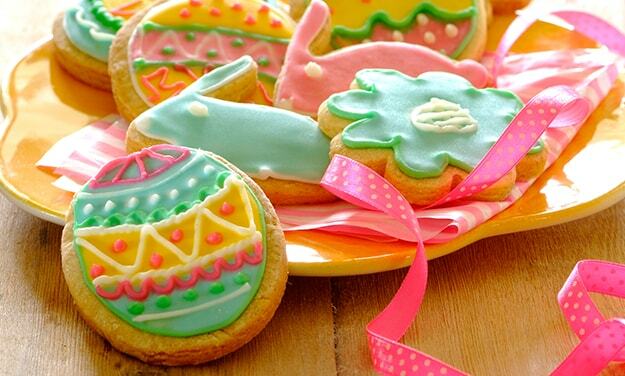 Try this iced easter cookies recipe for a delicious baked treat today. Stork – love to bake. Cream the Stork Bake and sugar until light in colour. Add the vanilla essence and eggs. Sift all the dry ingredients together and add to the Stork Bake mixture and mix thoroughly. Add the water if necessary. Roll out to a thickness of 3mm and cut into desired shapes. Place on a greased baking tray and bake at 200°C for 8 minutes. Remove from oven and allow it to cool before icing. Beat egg white and add to icing sugar and mix until a smooth piping consistency forms. Mix to the colour you desire. Spoon into small sandwich bags and push to one corner to make a piping bag. Snip off the corner and ice cookies.